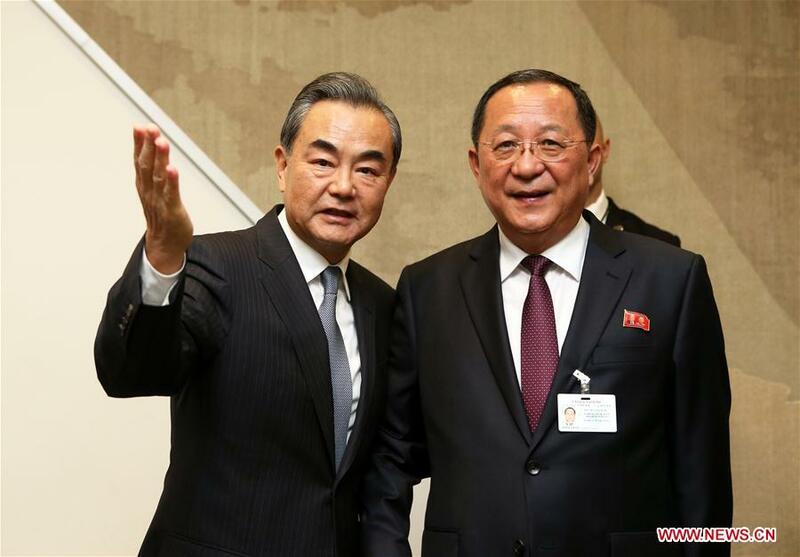 UNITED NATIONS, Sept. 27 (Xinhua) -- Chinese State Councilor and Foreign Minister Wang Yi said Wednesday that China fully appreciates the measures taken by the Democratic People's Republic of Korea (DPRK) to realize the denuclearization of the Korean Peninsula. Wang made the remarks at a meeting with DPRK Foreign Minister Ri Yong Ho while attending the United Nations General Assembly. China speaks highly of the Pyongyang summit held on Sept. 18-20 between the leaders of the DPRK and the Republic of Korea (ROK) and the joint declaration signed at the summit, and expressed clear support in a timely manner, Wang said. China supports the joint efforts to improve DPRK-U.S. and DPRK-ROK relations and to push forward the process of denuclearization of the Korean Peninsula, he said. On bilateral ties, Wang said that to constantly strengthen and develop the traditional friendship between China and the DPRK in the new era is a significant consensus reached by Xi Jinping, general secretary of the Central Committee of the Communist Party of China, and Kim Jong Un, chairman of the Workers' Party of Korea. China is willing to work together with the DPRK to implement the consensus reached by the two top leaders and steadily push forward exchanges in various fields, so as to maintain a good momentum in the development of bilateral relations, said the Chinese state councilor. For his part, Ri said that the DPRK attaches great importance to DPRK-China relations, adding based on the important consensus reached by the two top leaders, the DPRK is willing to promote high-level exchanges and strategic communications with China. The DPRK hopes to continue working with China to make efforts for the denuclearization of the Korean Peninsula and for the peace and security in Northeast Asia.